Today is the last day of the exams. Phew! I feel relieved ... But this semester is rather different. Usually the kids will receive their report card on the last day of the school before the break. But this semester, they will have it after the school break. Last night I made chocolate painting. 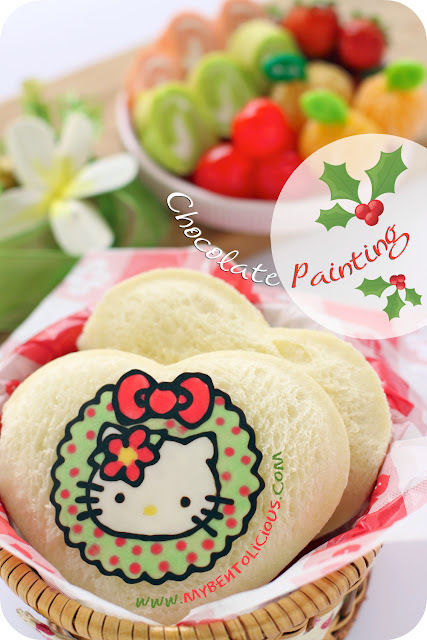 I used the Hello Kitty and the Christmas wreath picture that I found on the internet. This is my first time to do it. It took me 4 hours for the whole process from chopping the chocolate, melting the chocolate, paint the picture on the parchment paper and let it dry cold in the fridge for 1 minute. I only got 8 pieces, and I broke 1. I still need a lot of practice but it's fun to do. I want to take the pictures on how I did that but it was so hard to do the painting and have to take the picture by myself, so I just gave up. Probably next time. Kids love it especially the green chocolate is mint flavor. This time I didn't took a picture with the foods inside the snack box. But the foods that I prepared for the snack bento was pretty much the same : heart shapes sandwiches with Hello Kitty chocolate painting on the top, mini roll cake - strawberry & pandan flavors, sweetened cherries, mini strawberries, and mini tangerines. does the choc melt easily? So amazing! I love your photography styling too. Everything looks so mouth-watering good! Great job with the chocolate painting. Not sure I'd be able to do as wonderful a job. Plus this work of art is so perfect, I want to lacquer it and hang it on my Christmas tree! Super ambitious and beautiful. I wish I could take a seminar from you!! @sherimiya : Lucky that I'm not a big fan of chocolate. My husband kept taking the chocolate though last night, so I asked him to stay away from the kitchen LOL :D Thanks a lot Sheri for always so sweet with your comment! wow, marvellous job! now i know you are very good in painting too..
wow, you have lots of talent and patience! although it is your first time, the painting is very cute and good! This looks really cute and perfect. The hello kitty is so beautifully made. What an incredible artist you are :-) Doing the chocolate painting must take so much patience!! Making chocolate art would be better for me than doing icing, hehe :) Since I don't like chocolate I wouldn't eat as much of it! Gorgeous Lia! It's absolutely perfect! Incredible artistry, Lia! Your chocolate paining is beautifully clear and vivid and magically cute...WOW! @bentobird : Thanks a lot Jenn for your sweet comment as always! love the sanrio festive cheer!